Ancient Crosses At Ilkley by A.W. Morant, F.S.A. Ilkley Saxon Cross-Shafts used to stand in the churchyard. OS Grid Reference: SE 1163 4782. All Saints parish church is located on Church Street (the A65) in the centre of Ilkley, west Yorkshire, near the River Wharfe, and housed within are three Anglo-Saxon cross-shafts. Originally these ancient crosses had stood at the side of the church in the churchyard, but due to the ever-increasing fears of erosion they had to be brought inside the church. The church site is an ancient one, dating from the 8th century, but the present building is a restoration of 1860; the church here stands on the site of a Roman fort (Olicana) and there are re-used Roman altar stones in the fabric. The crosses are referred to as ‘Paulinus Crosses’, but they are probably of a later date than St Paulinus, perhaps from the 8th-11th centuries, and though many of the carvings are now very eroded, they are still quite magnificent to look at. The following is the work of A. W. Morant – which was published in ‘Stories & Tales Of Old York-shire’, 1993, but which originally appeared in the work ‘Old Yorkshire’, 1882. 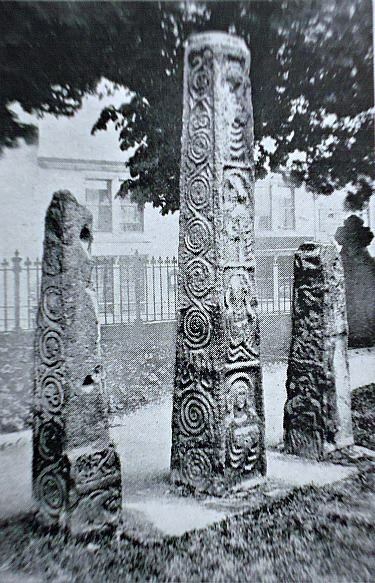 “In different parts of the churchyard are the remains of three very ancient Saxon crosses, wrought in frets, scrolls, knots, &c., which Camden, with that propensity to error, from which the greatest men are not exempt, conjectured to be Roman, only because they were placed within the precincts of a Roman fortress. But they are of the same kind, and probably of the same age, with the three crosses of Paulinus at Whalley, and with three others remaining in Leland’s time at Ripon, which there is great reason to ascribe to Wilfrid. “One thing,” saith that venerable antiquary, “I much noted, that was three crosses standing in rowe at the est ende of the chapel garthe. They were things antiquissimi operis and monuments of some notable men buried there; so that of the old monasterie of Ripon (the work of Wilfrid) and the town I saw no likely tokens after the depopulation of the Danes in the place, but only the waulles of our ladie chapelle and the crossis.” Such is Leland’s conjecture as to the occasion of their being erected; but from the same number, three in every instance, it is reasonable to suppose that they were early objects of religious reverence, alluding to the mystery of the Holy Trinity. 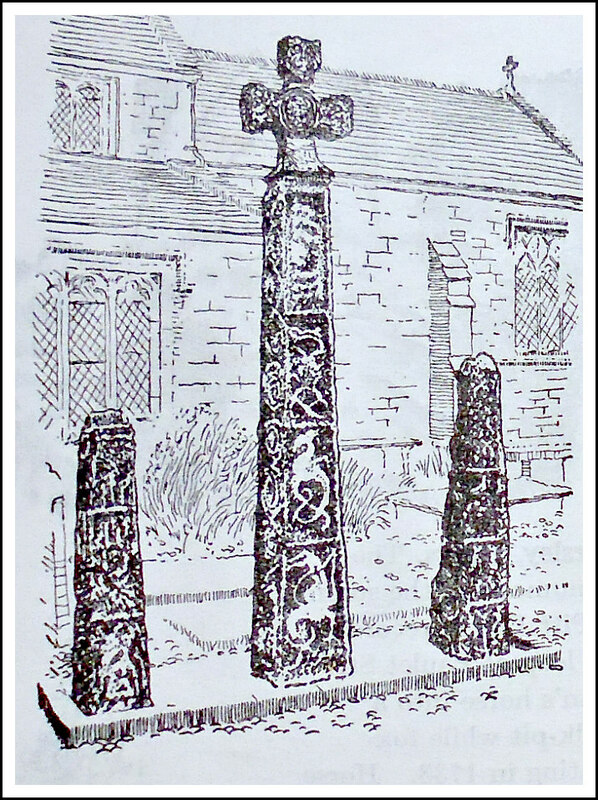 “The three crosses are now placed on the south side of the churchyard,…..and have been carefully examined and described by the late Mr. Wardell. That in the centre is the most entire, and is about eight feet in height; the others have been seriously mutilated by having been at one time made use of as gate posts, but are now, it is hoped, placed beyond the reach of further injury. These venerable relics are sepulchral monuments of the Saxon period, and of the same description as those of which only a few fragments remain at Leeds, Dewsbury, and other places. They are elaborately carved with scroll work and with figures of men, birds, and animals. The centre one, which is 16 inches by 14 inches at the base, tapering to 11 inches square at the top, bears on the north side the symbols of the Evangelists, in oblong compartments, human figures in flowing robes, each with the head of the animal which is his symbol, surrounded by a glory, and holding the book of the gospel. St. John, the uppermost, has the head of an eagle; St. Luke, the next, that of a bull; St. Mark, that of a lion; and St. Matthew, a human figure. The south side contains the figure of our Lord, and there appears to have been an inscription above his head, then a device composed of two animals whose lower extremities are knotted together; and then two other monstrous figures. The remaining sides have scroll-work, with representations of fruit and leaves. (Just to add a note here: the central cross-shaft has had a cross-head fixed to the top. This was apparently recovered from the River Wharfe in 1884 and may, or may not be, the original head). “The eastern one is about five feet in height and one foot square at the base, tapering to nine inches at the top, very much defaced and worn—having been used as a gate post; it bears two men facing each other, then two animals, with their lower extremities interlaced, then two others, and lastly two birds. The remaining two sides—for the fourth is mutilated—are composed of scroll-work. “The western one is about four feet in height, and much more worn and defaced than the others; it has on one side a scroll and the figure of an ecclesiastic in robes, holding a book; the designs on the other sides are almost obliterated. In this stone the mortice hole for fixing the cross is yet to be seen. A. W. Morant, F. S. A. Leeds. Morant, A.W., Stories & Tales Of Old Yorkshire (orig edt. by William Smith, 1882-3. Selected & edt. by Dawn Robinson-Walsh, 1993, Printwise Publications, Tottington, Bury, Lancs., 1993, [Stories & Tales Of Old Yorkshire selected from the work ‘Old Yorkshire’ 5 vols, 1882-3]. Categories: Ancient Crosses | Tags: All Saints Church at Ilkley in West Yorkshire, Ancient Crosses At Ilkley by A. W. Morant. | Permalink.